'The Hill of Home' by jan-u-wine, plus paintings by Grimshaw and Landseer. Jan-u-wine has written a new poem, "The Hill of Home", imagined from Frodo's point of view. Here it is, along with two paintings to set it off. The poem takes place during harvest, 1420, a very good year. Here he is, having woken before the dawn, and staying up long enough to drink in the beauty of night's end before going back to bed. When he was younger he might have pulled on his clothes and gone for a walk, starting the day. But after the Quest, perhaps Frodo has got in the habit of staying up into the night to write, to face demons -- or both, sleeping during the morning when the deepest dark has passed. What I love about this piece is the way it shows a moment of respite for Frodo, a moment of peace in spite of his post-Quest malaise. Perhaps it is a foretaste of a peace that will be his in the Undying Lands. Frodo must have had "good spells" after he came back. He couldn't have been continually listless, or suffering the torment of Ring-lust, after he returned. Catching Frodo in the midst of quiet appreciation of being home, in just such a moment as the one evoked in this poem, might have been how it was that Sam could imagine his beloved friend and master would finally recover and stay. There is joy in this poem, which Sam must have delighted to see, but also melancholy, which Sam could not, or would not see. should I ever want for? The paintings above were chosen especially to go with this poem. They aren't illustrations, of course, painted many years before Frodo was imagined by Tolkien, but we thought they suggested the mood and look of the poem's scene, moonlit dark before dawn during harvest. Jan-u-wine found the top painting, 'Under the Harvest Moon' (1872). It was painted by John Atkinson Grimshaw. (1836-1893). Grimshaw was not a Pre-Raphaelite, but he was influenced by them, drawn to rich colours, striking lighting effects and attention to detail. Although primarily a painter of landscapes and townscapes, a look at one of his fairy-like figures (of which he did nearly identical versions placed in different settings) shows the influence of Pre-Raphaelite figure painters like Byrne-Jones. Here's an example, his 1886 Iris. Whether his painting featured one of his fairies, a factory by the Thames or Hampstead Heath, his pictures were marked by their strong evocation of atmosphere. 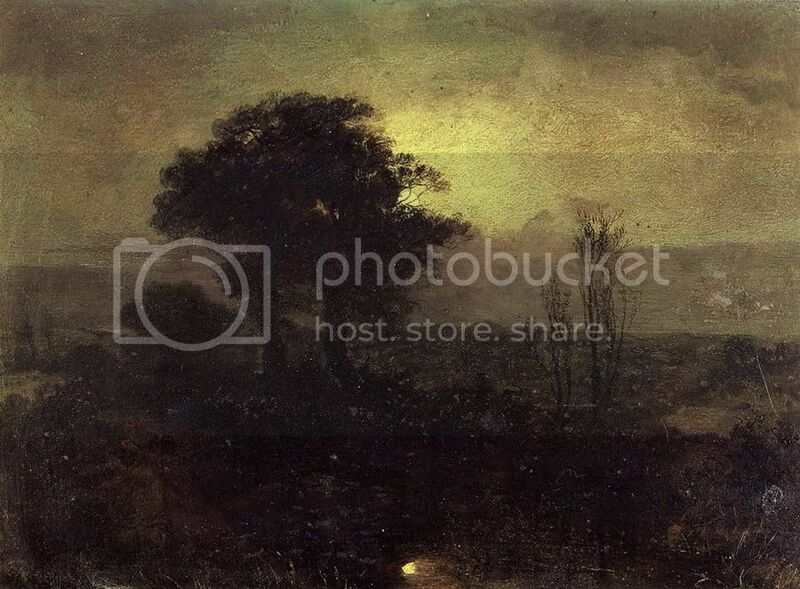 The painting below the poem is Landseer's 'A Moonlit Landscape', painted in 1827, when he was only twenty-five. Edwin Henry Landseer (1802-1873) was an extremely successful artist from early in his life, best known today for his paintings of animals. He was a respected member of the Royal Academy, was elected its president in 1866 (but declined due to ill health), was knighted, and had lucrative, even royal commissions. His personal life was less fortunate. In 1840, still in his thirties, he had a serious nervous breakdown, from which he never fully recovered, suffering ever after from fits of depression, hypochondria and melancholy, aggravated by substance abuse. He became more difficult in his last years and in 1872 his family had him declared legally insane. He died the next year, but he was not forgotten. Shops and houses lowered their blinds, flags flew at half-staff, the bronze lions he had designed at the base of Nelson's column were hung with wreaths, and large crowds watched his funeral cortege pass. His ashes were interred in St. Paul's Cathedral, in the crypt's "Painter's Corner", where the remains of other artists of renown were buried. ~ "Of Humans and Hobbits". Mews, I love your icon. There, had to say that first. I love the second painting too, because it has that misty look. And I plain love it, even before the poem was written. 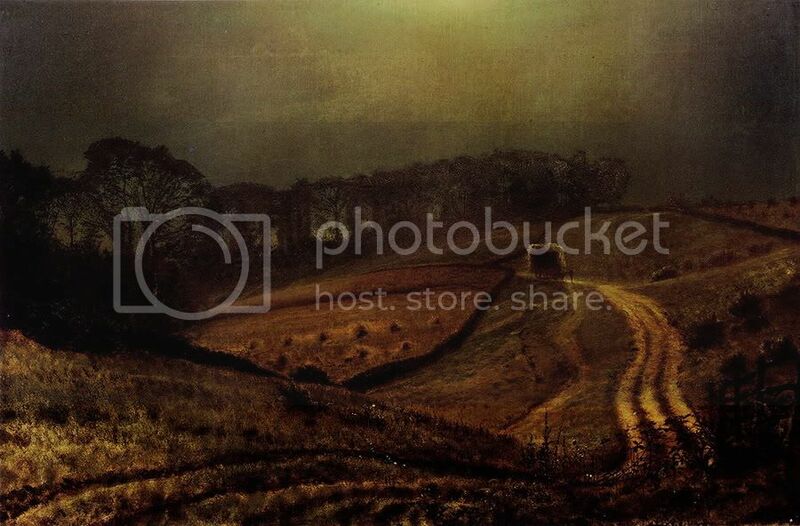 The Grimshaw, however, helps establish the idea of harvest time, which was why I put it at the top. Two moonlit paintings, one dry, one misty! thank you, Mews! That second painting is so very evocative, isn't it? Mechtild is brilliant in picking *the* very picture! Such simple, yet utterly rich imagery. thank you, Janet! I'm glad you enjoyed. Le hannon for this gentle, peaceful piece, my dears! I love that he can just 'be' for a bit. I think too he did not sleep well during the night but only dropped off with the dawn unless exhaustion forced him slumber sooner. Still, I do hope he had 'good days' also. It would be dreadful if he did not. Greetings, Antane. Ha ha - I am so terrible on Elvish I had to Google "le hannon" to substantiate my guess. You're welcome. Yes, I assume he had good days, as did returning WWI veterans, who had retained their sanity, however harrowing their experiences, or how frequently they were revisited by them. The poem portrays such an experience so well. I'm very happy that you enjoyed, Antane. For myself, I am quite certain that Frodo had many good days. How stark by contrast then, the ones that were bleak or (worse) dark. How terrible to realize that you weren't, in fact, getting better, that there was something within that your home couldn't mend as you had thought it could. But what a blessing to have the option that he did. Oh, these are so Fall-ish! Perfect for this time of year. Thanks for sharing. Wonderfully atmospheric paintings Mechtild. How strange that so many artists seem to have tragic lives and die young. I'm so glad you enjoyed the post, poem and paintings, Paulie. Yes, lots of artists seem to live less than optimal lives, but maybe they are not that far off the average. Some artists live to be very old; I was just ten minutes ago listening to a lovely recording of a Chopin piano piece on the radio, which turned out to be played by a pianist when he was 98 (!!!). Others die young, most die in their middle years. That may have been representative of the era. I don't think people expected to live nearly as long as they do now in Western countries, although there have always been exceptional people who have lived long, relatively healthy lives. What do you think; is it just because we remember the tragic stories, the early deaths? Often times artists die and we don't even hear about it (unless they are super famous), because they have long since dropped out of public life and have been living quietly for years. re artists and artistry....I have a brother who is an artist (a painter) and another who is a wiz on the guitar. Neither of them has ever been appreciated as they should have been. Sometimes I wonder if that is what kills artists. But then again, moderate success seems just as lethal and *super* success sometimes the most lethal of all. At the end of the day, I think it all comes down to the same things it does for the rest of us commoners: how you look at yourself, the place you are assigned in the great tapestry of life. Striking that balance between greatness and smallness (the task that Frodo had to go over-Sea to complete, to be healed and find happiness). Being too engaged, I think, in self-hood is a capital mistake, leading to all sort of internal ills, whether they be sicknesses of being hugely arrogant (or just as bad) the illness of your self-worth being dependant upon the validation of those around you. oh fantastic poem! Hobbits are earthloving beings, and this just breathes that one-ness with the soil and the Home and all those things truly hobbity. I don't know how she does it.. One must really get deep into the mind of Frodo to see this aspect I think. Lovely! I don't know how she does it.. One must really get deep into the mind of Frodo to see this aspect I think. thank you so much, eandme. Being able to write these pieces has been such a blessing and wonder to me. So glad you enjoyed!